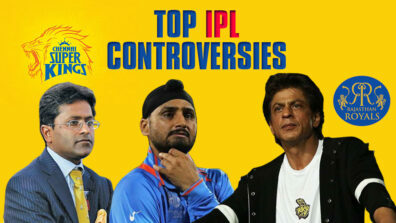 Among others, there are two things that Indians are most obsessed about – Cricket and Bollywood. So, naturally the two worlds are bound to collide. 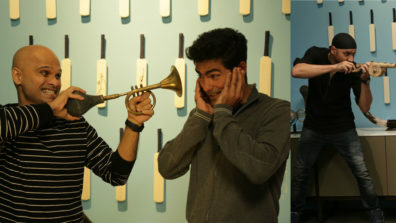 And when they do, we see a lot of Cricket-Bollywood jodis happening off the field. Some of the famous couples being Manzoor Ali Khan Pataudi and Sharmila Tagore and the more recent Yuvraj and Hazel, VIrat and Anushka or Virushka as they are fondly called. One such beautiful love story is that of Chennai Super King’s off-spinner Harbhajan Singh and Bollywood actress Geeta Basra. 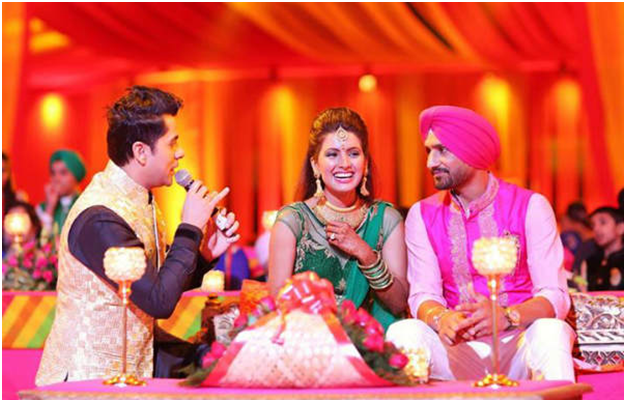 Cricketer Harbhajan Singh and Geeta Basra’s love affair started with a music video. 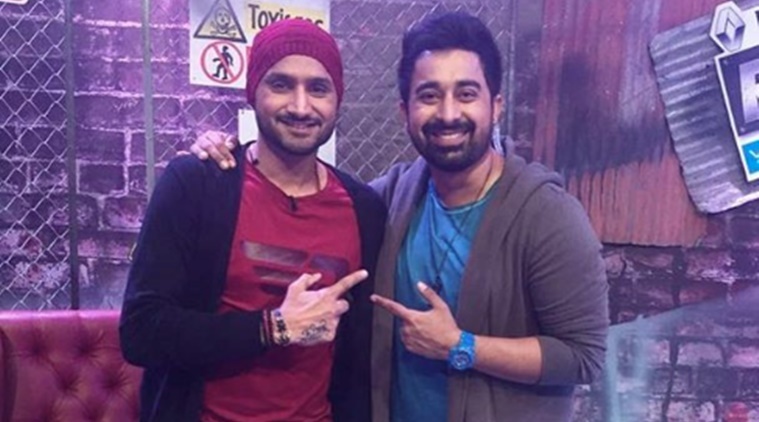 It was love at first sight for Harbhajan after he saw Geeta in a music video ‘Woh Ajnabee’ from the movie ‘The Train’. Harbhajan was star-struck and immediately started thinking of ways he could meet her. At the time, he did not have any connections to in Bollywood but he asked his friends and eventually got her number. He texted her asking for a meeting over tea but Geeta ignored him for the longest time possible, only to congratulate him later on the T-20 World Cup win. Born and brought in England, Geeta was new to the Indian landscape and was just starting her career in Bollywoo. She was not looking for a relationship at the time. Poor Harbhajan was left chasing Geeta for 10 long months before she finally gave in. She realized he was a nice guy and her friends too gave her the go-ahead, that’s what eventually convinced her. The first time the two met was when Geeta texted Harbhajan asking for two tickets to the first season of IPL. They met over coffee during the match and became friends which transitioned into love. Harbhajan was eager to ask Geeta out but she was wary and told him they needed to be friends first and then take it from there. But every love story has its ups and downs. It happened in case of Harbhajan and Geeta too when she suggested they stop seeing each other and move on. Later, Geeta realized she was missing him and the two reconciled. The couple dated each other for 5 years and kept their relationship very low-profile away from the prying eyes of the media and never confirmed it publicly. 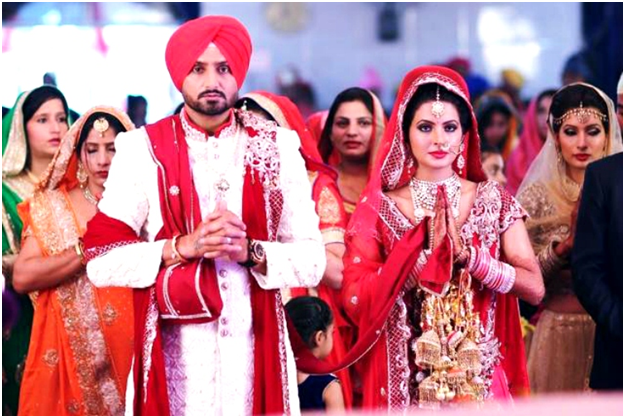 Harbhajan and Geeta got married in 2015 in a traditional Punjabi ceremony. The couple was blessed with a baby girl, Hinanya Heer, a year later in July 2017.